Ivano-Frankivsk lies in the Precarpathian plain where fast waters of the Nadvirnianska Bystrytsia and Solotvynska Bystrytsia join together. 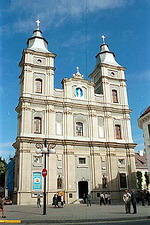 Ivano-Frankivsk is the regional center and one of the largest economic and cultural centers in the west of Ukraine. The first mention of the city named Stanyslaviv refers to 1662 when the city received a Magdeburg right. The city was founded as a fortress to protect people from Crimean Tatars’ raids and a stronghold of the Pototskiy – Polish landlords on Halych lands. Many times the fortress was besieged by Turkish and Russian troops. Stanyslaviv was originated from the Market square and City Hall, which can be seen today having been modified. The Renaissance architectural ideas of "the ideal city" were reflected in the construction that followed. These ideas were used for planning a middle part of the city, its streets and churches. Because of the originality of architecture sometimes the city is called "small Lviv". In 18-19 centuries the city was a big trading and manufacturing center of Poland and from 1772 – of Austria (since 1867 – of Austro-Hungarian Empire). Except Ukrainians, Polish, Jews and Armenians whose national communities were quite numerous made a certain contribution in development of crafts and culture. The second half of the 19th century is marked by fast development of industrial relations and creating enterprises. The railway built in 1866 made some impact, too. At that time the locomotive repair factory, distillery, leather plant "Plai" were established. In 1884 a prominent public character and writer N. Kobrynska conducted constituent assembly of the "Rus Woman Society" (later called "Ukrainian Woman Society"). This initiated the organized woman movement in Ukraine. During the World War in 1915-1916 there were cruel battles over the city. Part of historic buildings was destroyed and then restored in new architectural forms. In 1918 after break-up of Austro-Hungarian Empire there was created the West Ukrainian People’s Republic. Stanyslaviv was the capital of the Republic in January-May 1919. Such prominent public figures as M. Hrushevskyi, V. Vynnychenko, S. Petliura, Y. Konovalets used to come here at that time. 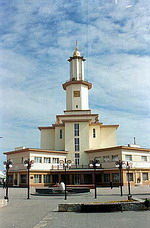 During the World War II the city was occupied by fascist troops for three years (1941-1944). The underground representatives of the Organization of Ukrainian Nationalists – Ukrainian Insurgent Army were in charge of the struggle with occupants. The hearts of people are still aching when they recall the public execution of 27 patriots in the center of the city in November 1943. In Stanyslaviv and its suburbs fascists killed more than 100 thousand peaceful people in total. In 1962 the city celebrated its 300-anniversary. It was renamed after a famous writer and public figure Ivan Franko, who would come here more than once, made good friends, wrote and recited his works. The inhabitants of Ivano-Frankivsk and Halychyna gladly accepted democratic changes in 90’s and became a driving force of all the events. The blue and yellow national flags were already raised over the city in 1990 and during the referendum in 1991, people voted for independence of Ukraine. Every year in August they celebrate a City Day with concerts of folklore and art ensembles. The Christmas parade of verteps (Christmas plays) from January 1 to January 14 on the streets and squares of the city is a spectacular sight. Also Ivano-Frankivsk is famous for its all-Ukrainian festival of art ensembles "Precarpathian Spring" (in May every year), festival of a national and patriotic song and poetry "Volia" (Freedom) (in October odd years). Ivano-Frankivsk is a large center of mechanical engineering, wood-processing, chemical and light industry. The Precarpathian University named after V. Stefanyk, the Ivano-Frankivsk State Technical University of Oil and Gas, the Medical Academy, the Spiritual Institute of the Greek-Catholic Church train their students to become skilled specialists. There is bus and railway communication with Bulgaria, Moldova, Poland, Russia, Romania and Baltic countries. Planes come and go to Manchester (Great Britain), Moscow (Russia).